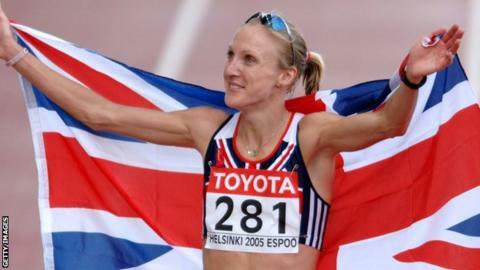 Marathon world record holder Paula Radcliffe says elite sport could be open to "manipulation" unless tighter rules are applied to transgender women. International Olympic Committee guidelines state that transgender women must suppress testosterone levels for at least 12 months before competition. But Radcliffe questioned whether that should also extend to surgery and has called for further research. "Right now, transgender women are not a threat to female sport," she said. "But you would be naive if you thought that, by not putting in any rules, it couldn't come to that at some point in the future. "People will manipulate this if there is an opening there to make money and win medals and we've seen the lengths people go to, the lengths Russia went to cheat in sport. " She told BBC Sport: "Absolutely, any transgender men or women should be able to access sport - it just depends which category. "We need to protect female sport but we also need to protect transgender women and their rights. "For all this to advance fairly to everybody, we have to accept it might take a while, work together and stop attacking the other side." The debate about whether it is fair for transgender women to compete in female sport has come into focus since a row developed between transgender cyclist Rachel McKinnon and former tennis player Martina Navratilova. McKinnon, an age-group world champion, has accused 18-time Grand Slam singles champion Navratilova of being a "transphobe" for suggesting that the participation of transgender women in women's sport would be equivalent to "cheating". Radcliffe has also questioned whether it was "fair for a biological man to compete alongside women". But the 45-year-old believes more research is needed to establish an appropriate level of testosterone in transgender women in order to create fair competition. The current level of testosterone allowed by the IOC will drop from 10 nanomoles per litre to five for the 2020 Olympics. Joanna Harper, a medical physicist who advises the IOC on regulations for transgender athletes and is herself transgender, told BBC Radio 4's Today programme that hormone therapy made it a more level playing field. "Transgender women prior to hormone therapy have all of the advantages of male athletes," Harper said. "If we were talking about elite sports, professional sports, then I think it would be very wrong to allow transgender women into those sports without undergoing hormone therapy." But she added: "There's no evidence to suggest that transgender women on hormone therapy will take over women's sports." Radcliffe said: "You don't have to talk about excluding transgender women from sport, but I don't know if the current levels go far enough. I'm not an expert, but I'm trying to safeguard the future of female sport. "I think 10 [nanomoles per litre] is too high given I've read that the normal female range is up to two. So five might be about right. "Both sides need to be protected, and calm, scientific research needs to be done. You can't have the two sides doing the research; it has to be neutral." Radcliffe also called for a halt to the "attacking and bullying" which she believes has existed between groups and individuals with contrasting views. "The amount of bullying from both sides is not right," she added. "Some of the things said about transgender women are offensive, rude and disrespectful but some of the things said about what Martina Navratilova tried to say are not respectful either. "We have to understand there are human beings at the centre on both sides of this, and it's not something which history is going to help us with either. "We have to work together and respect everybody and try to find the best solution we possibly can."